After schlepping my VHS tapes collection for about 15 years, I realized those movies are NEVER going to see the light of day or a screen, for that matter. . I didn't have the heart to throw away all those memories - Bruce Lee's Big Boss, Rob Reiner's The Sure Thing and a lot of MTV's 120 minutes and alternative nation. I wanted to reuse the tapes and not dump them. 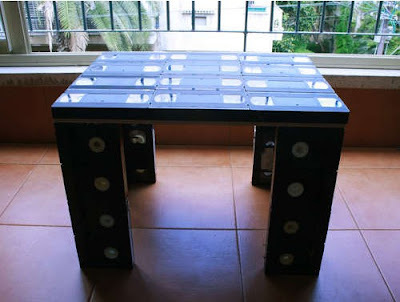 So, I decided to turn the tapes into a table. Only thing I had to get was a piece of wood (56X41.5 cm), and some strong glue. and then I attached the legs. After this Beta (pun intended) The next step is building a TV, DVD and stereo cabinet from tapes. Naturally, I don't expect the table to hold something like a TV, but it seems sturdy enough to handle most light social needs. But again, it's not the sort of weird thing I'd want in my place. Click here to see other Wednesday posts (including the current one).